This week you’ll be creating a product via the Diels-Alder reaction. The Diels-Alder is unlike other organic reactions in that it doesn’t involve any nucleophiles, leaving groups, or radicals, so there is no real mechanism to learn. I’m going to go through the concepts behind the Diels-Alder reaction, and then explain what you will go in this week’s lab, which is actually rather short. What Is the Diels-Alder Reaction? When you heat up a conjugated diene in the presence of an alkene they will react to form a cyclohexene ring. Because the alkene “likes” to react with the diene, it’s called a dienophile. The reaction occurs via a concerted mechanism, meaning that it takes place all at once, with no isolatable intermediates. The Diels-Alder is a stereospecific reaction, because the stereochemistry of the dienophile is maintained in the cyclohexene product: a trans dienophile yields in the trans product, and a cis dienophile yields the cis product. Only conjugated dienes in the s-cis conformation can undergo Diels-Alder reactions. If a diene is not conjugated, or can’t be in the s-cis conformation, then it can’t undergo a Diels-Alder reaction. Dienes that are located in rings can’t rotate, and so are stuck in either an s-cis or s-trans conformation. But acyclic dienes can rotate into the s-cis conformation, as long as their substituents aren’t too big/bulky to prevent easy rotation. 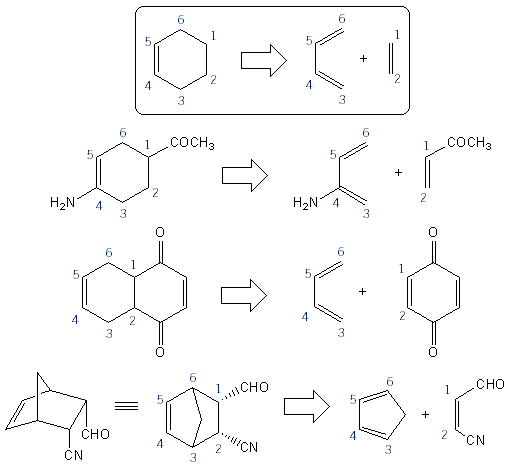 The easiest way to predict Diels-Alder products is to number the six carbons that make up the cyclohexene ring. Below are some examples using this strategy. When the diene is a ring such as cyclopentadiene ("cp") or cyclohexadiene, the product will be bicyclic, with a bridge between C-3 and C-6. 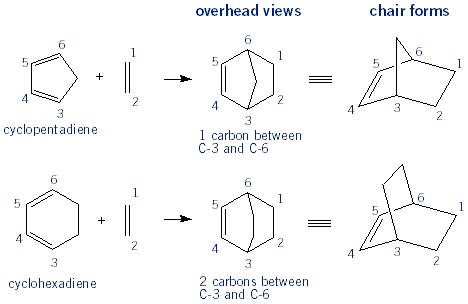 Carbons 3 and 6 are refered to as the bridgehead carbons. These bicyclic products are not normally drawn in an overhead view, but instead drawn in a cyclohexane chair form. With cyclopentadiene (and cyclohexadiene) it’s possible to get both endo and exosubstituents. 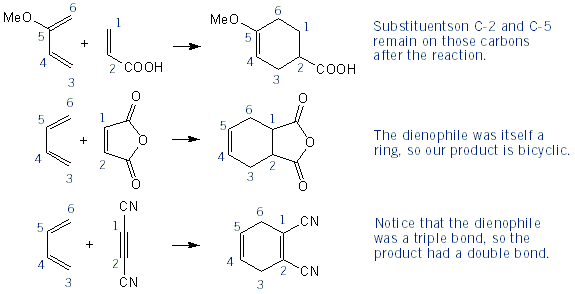 But because of the way orbitals involved in the Diels-Alder reaction align, Diels-Alder products are always endo! The Diels-Alder reaction is reversible. Going from cyclohexene to a diene and dienophile is called a retro Diels-Alder reaction. It’s also a very common to be asked “what starting materials produced this Diels-Alder product?” The best strategy for determining retro Diels-Alder questions is also to number the cyclohexene ring. Below are some examples. You should be aware that cyclopentadiene (cp) will spontaneously react with itself, so it can only be stored as the dimer. Heating up the cp dimer with "crack" it back to the monomer. You will dissolve ~4g of maleic anhydride (be sure to measure the exact amount) in ~15 mL of ethyl acetate (EtOAc) in a 125mL Erlenmeyer flask. Let the maleic anhydride dissolve in the EtOAc, by heating if necessary. Then, add ~15 mL of hexane and let it cool in an ice bath. Once cool, obtain ~4mL of cold cyclopentadiene from your TA. It’s important that you keep it cold and add it to your reaction right away; if the cyclopentadiene warms up it will spontaneously form the dimer (see above for explanation). As your swirl your flask the reaction will take place right away. You will see product precipitate out of solution. After ~5 minutes the reaction is done. Your last step is to perform a recrystallization on your product by heating the Erlenmeyer flask up again and then letting it cool. Then collect the product by vacuum filtration. You will probably let it dry in your drawer for a week before you take a melting point and weigh your product for a percent yield.